Running tips for running moms will help you get the most out of your run and better yet, enjoy your experience as a running mom. How do you run with kids? Running with your baby is a great way to get in a good workout while getting some fresh air and bonding time. If you have a baby or toddler, the best way to do this is to run with a jogging stroller. What Age Can Your Baby Ride in the Jogging Stroller? The earlier your baby gets used to riding in a jogging stroller the better. I started mine at about 2-3 months. They can usually ride in the jogging stroller until they are about 3-4 years old. Running with a jogging stroller is a great full body workout. To make it even more effective, engage your abs. I can finally do pushups for the first time in my life after running with my jogging stroller! It will take time adjusting to running with a jogging stroller, but you'll get the hang of it after a few runs. Here are some on running with a baby jogging stroller. Here are some tips on how to keep your baby entertained while running in the jogging stroller. What do you do when your kid(s) have outgrown the jogging stroller or when you just need to get in a good run without the kids? Here are some alternatives. The reason I started running-mom.con was because I wanted to keep running after I had my baby and I could not find good nursing running bras. So I asked some other moms what they wear and I was thrilled with all the helpful advice I got. Here are some running sports bra reviews if you are looking for specific recommendations for you needs. There are reviews from moms of all sizes. If you're nursing here are some sports bra selections that you can run and nurse in. These running tips go for the new runner and the experienced runner. One of the hardest things to learn as a running mom is to not push too hard, too fast. Congratulate yourself for every accomplishment. 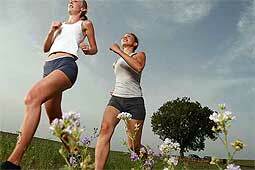 If you ran a 31 minute 5k for the first time after giving birth, don't beat yourself up because you could run a 29 minute 5k before giving birth. You have way more on your plate now and whether you were a runner before or not, running as a mom is a new experience. Every achievement post-baby is a new achievement. Here are some running techniques for pacing yourself during your run. Starting over can be hard, but we are the better for it every time! Do you feel like the minute you get out the door and start running, your bladder seems to have an automatic button that forces you to start looking for a bathroom or making sure no one is watching while you pee behind a bush? You're not alone! Here are a couple things tips that will help. Keegle exercises are a great way to help strengthen your bladder. Instead of drinking a big glass of water before your run out the door, drink smaller sips more frequently throughout the day. 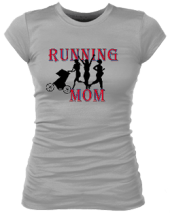 Finding other running moms like you can be a great help! Here are some ways to do this. 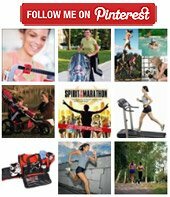 Start or join a running mom group in your area. You can meet other running moms here. I interview a different running mom each month and share her inspiring stories and tips with you. You can even nominate yourself. If you are pregnant and wondering if you can run, aside from checking with your doctor, you can read the stories of other pregnant running moms and get running tips from them here. If you have just had a baby and are wondering when to get started running or hoe to get started, here are some tips on post pregnancy exercise.